It was an overcast day as St Matthews kicked off; for NCC this was their final game of the season. However it was the visitors, the NCC, who made the initial foray. In the opening ten minutes play was quite even, with each side having a couple of penetrating runs. By then the teams were finding their rhythm, and St Matthews had the first real chance. Then Ian Jones demonstrated his ball skills, as he set off down the right wing. Although he outpaced three opposition players he was unable to pass the last man, and the opportunity was gone. NCC had a free kick, which went to Martin Eccles, waiting just outside the left hand post. His header was sent over the bar, and the Saints could breathe a sigh of relief as they mounted a succession of attacks, which saw them gain a couple of corners, and force Tim Rudge to pull off a good save. Approaching the end of the first quarter the hosts defended a corner, amidst a tightly packed goal area. Having successfully cleared this threat they were attacking, but their shot went wide of the goal. After twenty-five minutes another attack from St Matthews saw a lone forward speed up the left wing, easily outstripping the NCC defence, and approach the goal. It was a relatively straightforward task for him to send the ball past Tim Rudge, as three defenders arrived, only to become spectators. For the next ten minutes play was evenly balanced, before the visitors were attacking again. Here they created two good opportunities, the first, at the left hand post, and the second at the other post, where Ian Jones tried to flick the ball into the net, only to see it hit the side netting. The Saints had a free kick, which was cleared, and followed this up with a header, which crossed over the bar. Increasing their pressure St Matthews gained another corner. After an injury delay this corner was partially cleared, allowing an attacker to drill the ball through the packed players, and so into the net, to double the score. Just before half time the home side nearly increased their lead, as the ball, having hit the cross bar, rebounded back into the field of play, but was successfully cleared by the NCC defence. Although NCC kicked off the second half the home side started much the better, creating several chances and winning a couple of corners. After some five minutes the players were subjected to a heavy and prolonged shower. Undaunted, the NCC attacked, and gained a corner, which was cleared. Approaching the hour the Saints netted their third goal; an attack resulted in their shot being deflected upwards off the legs of Tim Rudge, before he lay prone. Despite rising quickly, and three defenders coming in from the far side, none was able to prevent a brace of attackers from poking the ball into the opposite corner of the net. St Matthews dominated the next ten minutes of play. With half an hour remaining they had a free kick, just outside the penalty area, and on their right wing. From the shot, apparently a mishit, the ball curled over the wall and beyond the reach of Tim Rudge, to descend onto the far post. Here Lady Luck smiled on them, as the ball rebounded directly into the goal! Both sides continued to attack, and some excellent football was exhibited in this half, with each side demonstrating their collective team skills and individual ball expertise, despite the tacky surface. The Hoops were fortunate when another Saints’ attack saw them outstrip their defence, and send the ball into the net, but the offside flag had already been raised. St Matthews created two more threatening opportunities before the NCC, enjoying the warmth of the sun, played some of their best football of the game. A determined attack up the left saw Ian Jones run behind the opposition, before crossing the ball; this resulted in the ball just passing over the crossbar. Shortly after, the visitors were up again, and pressed hard, following a corner; with the keeper pushing the ball over the cross bar, for a second successive corner. Keeping up the pressure Mark Broekman had half a chance, and Ian Jones attempted a flick on. Then, with five minutes left, Ian Jones, free on the right, was able to dribble around the defenders and select his spot, to pull back a late consolation goal. As the full time whistle went the NCC was defeated, but not outclassed. Following a night of rain the day of the vernal equinox dawned wet, but just before kick-off the heavens closed, providing the game with a short and welcome dry interlude. The visitors started well, and had an early corner, which was just headed wide of the right hand post. Then it was the turn of the hosts to advance, down the slope. Chased by a trio of rampant Tigers Ian Jones hammered the ball, from way outside of his right, towards the goal area. The ball took a slight deflection, sufficient to cause confusion, as the keeper could only watch it enter the far corner of his net; seven minutes gone. During the next five minutes the Tigers fought back, dominated play, and had a shot pass wide of the goal. Then Tewkesbury had a free kick on their left side. A high ball was aimed in front of the goal, where a rampant Tiger was able to elude his marker, and, with clinical efficiency, head the ball into the goal; another area devoid of tiger traps. Following a series of Tiger attacks, which won several free kicks, and twice forced Tim Rudge to smother the ball, NCC was again on the move. After twenty-four minutes they attacked down the left wing, where Ian Jones met a delightful cross. With great composure he slid the ball into the net, almost from beneath the claws of a Tiger defender, to restore the NCC lead. By now the hosts were in the ascendancy, albeit by a small margin. On half an hour a long ball was propelled towards the Tigers’ keeper. In his endeavour to gather the ball he fumbled, and dropped it, which allowed an effervescent Ian Jones to guide the ball around him, and then thrust it into an empty net; to complete a thoroughly deserved hat trick. The game was becoming enjoyable as the Undertakers continued in their quest for goals. During one such attack Martin Eccles was pushed from behind, and mauled to the ground, resulting in the award of a penalty. Up stepped the wizard, who sent a low fast shot past the despairing reach of the goalkeeper, to bring his match tally to a quartet. Suddenly it seemed as if the Tigers had sensed an upsurge, and increased their pressure. In the final ten minutes they created some chances, and then, just before half time, had a free kick, well outside of the box, and on their right wing. The Tigers sent a beautifully flighted ball, which sailed serenely over the wall, before descending, to dip under the bar and into the net. With their tails up the Tigers continued their raids, until the interval intervened. Although the half time score was 4-2 the Tigers would have the tacky slope in their favour after the break. For the majority of the third quarter NCC was the more creative, but their attacks lacked that final finish; after an early NCC miss the Tiger keeper eventually grasped the ball after what seemed to be a prolonged juggling act above his head. NCC had another chance to score but the ball was headed wide, and towards the end of this period NCC had another excellent opportunity when Ian Jones was through, with only the keeper to beat, but was denied by the keeper pushing the ball away. A few minutes later there was a similar event, only this time Guy Speedie, in a better position on the right wing, was calling for the ball. Unfortunately the shot sped diagonally across the face of an empty goal, and behind for a goal kick, and another great chance was lost. I think this was the turning point of the match; then the Tigers became the hunters, with great success, as we shall see. Then followed a balanced period of play, which saw the Tigers increase their stride. A well-coordinated Tiger charge took place down their right wing. Here the delicate cross was met by a crouching Tiger, who fired a low shot into the far corner of the net, to set up a nervous final ten minutes. Soon after this NCC had their concluding attacks; one, from a corner, hit a post. From then on it was all the visitors, who had a series of pulsating chances, including a sensational miss with an open goal begging to be filled. However, with two minutes remaining, Tewkesbury had yet another free kick, from just outside of the goal area. The NCC wall was static, and astonished, as they could only follow the path of the ball, as it flew over their heads, before dipping, to crash into the back of the net. The hosts were stunned; and were fortunate not to lose as another Tiger shot went wide of the goal. As the final whistle went the NCC looked bewildered and confused; they had not won a game through which they were sailing so stately as the second half started. On a cold and cloudy day NCC kicked off this match, against the league leaders, and was immediately on the attack. Shortly after the start Cambray sped up their left wing, past the home defence, and sent over an aerial shot. This was well kept out by Ryan Adams, who jumped up and pushed the ball over the crossbar, for a corner; which was headed wide; pulsating stuff. After five minutes déjà vu, when Cambray, running free on a direct route towards the goal, and the home defence missing, was able to lift the ball over the head of Ryan Adams. He was forced to come off his line in an effort to prevent the goal, but could only turn and watch as the ball entered the net. During the next twenty minutes, or so, the visitors mounted a series of attacks, up both wings, winning several corners, including two in succession, but were denied by a determined defence, and some excellent saves by the keeper. Cambray had a low diagonal shot, from the left, which crossed the field of play, eluding several players, as it headed towards the goal line. In between the hosts made some forages to the opposite end, where Jason Roberts had a great shot well saved by the keeper, and another shot, tantalisingly, crossed an open goalmouth. In the twenty third minute of this half another Cambray attack came up the left wing, and easily outpaced the home defence. Caught in a dilemma Ryan Adams had little choice but to come out again to meet the ball. As he neared the edge of his area the ball was lifted over his head. Jumping up, unsuccessfully, the keeper, by now prostrate on the ground, could only watch as the ball rolled into the net, followed by a couple of the NCC defence, arriving far too late to prevent this second goal. The hosts had a short spell of promise in the Cambray half, but were denied by a combination of the defence, and unfortunate finishing, but it did show promise. However, for much of the remainder of the half Cambray ran the show, with a series of penetrating runs, mainly up their right wing, resulting in shots or corners gained. It was noticeable that Cambray favoured the aerial ball, and at least half a dozen were sent speeding through the air, but all to no avail, as it turned out. Despite the injury to his upper leg Ryan Adams was doing excellent job in goal. During the opening minutes of the second half each side missed comfortable chances. Cambray missed an open goal, and Chris Rudge, seeing the keeper coming towards him, lifted the ball over his head, but the ball flew across the area, just wide of the goal. NCC continued to attack, and was playing with more composure. Huw Roberts had a shot sent straight into the arms of the keeper, and another great chance was presented when Ian Jones met a long throw, from Jason Roberts. Facing the wrong way he was able to out-jump a group of opposition players, but could only head the ball wide of both his team and an empty goal. Another chance was created, in an entertaining period of play, before Cambray returned to the attack, forcing another diving save from Ryan Adams. Then Cambray was awarded a free kick, on their right flank. Another of those aerial balls was sent over the heads of the five-man wall, and the ball continued into the far corner of the net. Cambray continued to pile on the pressure, but the NCC keeper made a couple of good saves. Then, approaching the hour mark, he aggravated his injury, and play was held up for a minute. A few minutes later Mark Broekman made a determined run up the right wing, and outstripped the wanton defence. Seeing the keeper standing by the near post he coolly hit a high shot, which flew over the keeper, and into the net. 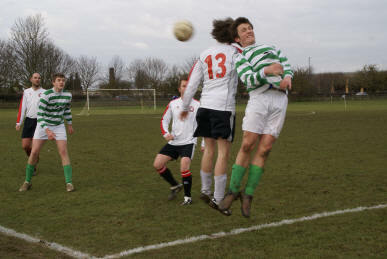 Then NCC had a short period in which they played some brilliant football, but was unable to profit. In the last twenty minutes Cambray stepped up the pressure, and created a whole series of chances, but was unable to put any away, one shot bounced off the top of the crossbar. Meanwhile, NCC in their turn was becoming better, and they applied sustained pressure, but on many occasions Ian Jones was unable to beat the offside rule. With eight minutes to go another attack lead Cambray to score again, when the ball came down the right wing and was headed home by a player diving low to make contact; and this despite a valiant effort by Martin Eccles, who ended up in a vertical position! By now the teams were playing in time-added on, and what a dramatic four-minute finale was had. In the opening minute a meticulous ball found Ian Jones, who was able to break free and thread a delicate shot between the keeper, and his right hand post; nothing less than he deserved. Within a minute another good ball found a Cambray attacker in the clear, and he was able to poke the ball past the keeper and an NCC defender, an event which saw all three players end up in a heap. In the final minute NCC gained two corners, but was unable to penetrate a packed Cambray goal area, and so an entertaining game finished with Cambray still at the top of the league. On a cold day Diamonds, the hosts, took centre, and played down the field, with the advantage of the slope in front of the NCC goal. NCC started with two good chances to open the scoring; the first fell to Andrew Murton, who shot wide, and then, from a corner, Martin Eccles headed over the bar, a promising start. After six minutes the home side had a free kick on the right hand side. They sent a well-directed lob, which passed over the head of Ryan Adams, the NCC keeper for the day, and arguably not standing in the best of positions, before entering the net; a disappointment, and one with the appearance of a degree of good fortune for Diamonds. NCC continued to create pressure, and both Mark Broekman and Martin Eccles came close. After twelve minutes Andrew Murton made a great solo run up the left wing and hit a diagonal shot past the keeper, who had advanced to meet him, into an empty net, to level the scores. In the following ten minutes the home side attacked, and gained a series of corners, including three in succession. From yet another corner the ball was delivered obliquely towards the penalty spot, where a waiting player hit a powerful header, to restore Diamond’s lead. This pulsating game continued, with further chances created by both sides; Tom Hardcastle saw his shot go wide of the upright. After half an hour Diamonds delivered a fine long ball, which went through the NCC defence to a waiting attacker. He dribbled round two defenders and then unleashed a fierce shot, which was bravely knocked out by Ryan. However, the rebound landed at the feet of another player, who had the easiest of jobs to put the ball into an empty net. In the remaining minutes of the half NCC had two further chances, one from Tom Hardcastle, which was very well parried for a corner, and the other, from Andrew Murton, which passed wide of the goal. The team with the advantage of the slope had scored most of the goals, would history repeat itself in the second half? Although the opening ten minutes of the second half saw plenty of action at each end it was the NCC who attacked more frequently, gaining two successive corners and seeing a near miss from Lee Bradley. Two minutes later the visitors made the cardinal mistake of not playing to the whistle, their defence stopped because they thought a player was signalled offside. To their horror the home side continued their attack up the right wing and a weighted cross was met by an unmarked attacker, who rifled the ball into the net. Within two minutes NCC won a corner. Emlyn John sent over a high cross, which was met by Martin Eccles, who headed the ball downwards, bisecting the two static defenders, and so into the net. 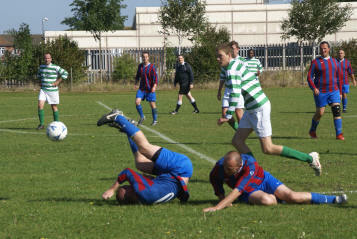 Once again NCC were losing to Diamonds by 4-2, as in the game played in September. This goal seemed to rattle Diamonds, who were losing some of their polish. During the next seven minutes play alternated, although the visitors were the more active. Then, shortly after the hour mark, another NCC attack saw Emlyn John send in a dazzling volley, which sped across the ground like a rocket, shooting past several astonished defenders, to end up in the bottom right hand corner of the net; and so set up a nail biting final twenty minutes. Although the green and whites created greater pressure both sides had further chances to score, but were denied by good keeping or else their shots were wide. Then Diamonds were awarded a free kick, from just outside the centre circle. 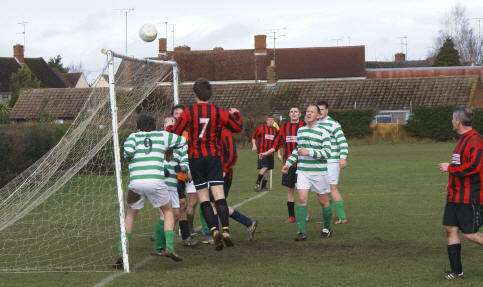 Ryan Adams, jumping up on one leg, skilfully saved a wonderfully taken shot, which appeared to be dipping below the bar. With five minutes left Mark Broekman, leading an attack down the right wing, found Ian Jones, who prodded the ball into the net, to the right of a frantic lunge from the desperate keeper, to tie the score. Then we had an exciting last few minutes, in which NCC nearly won the game, with Ian Jones and Tom Hardcastle both shooting wide. 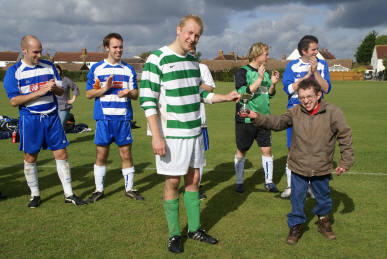 As the full time whistle went a draw was the fairest result for this effervescent match, a game of two equal halves. It was a fresh morning as NCC kicked off this match, a game which exhibited tenacity and excitement, but one which was lost in the opening two minutes of the second half; more anon. From the onset Cornerstone seemed both fitter and faster, but then they might have adapted to the tacky conditions quicker than their hosts, as well as having a slight advantage with the slope. Controlling both space and the ball they mounted several attacks down their right wing, which saw them gain three good chances. They were denied by some brave and brilliant keeping by Tim Rudge, who read the situation to perfection; he saved one shot by a split-second blockage with his legs. In this he was ably supported by his defence, in particular the sterling work carried out by Adam Cox. By no means were NCC totally outplayed, and they created chances of their own; one effort, from Jason Roberts, was pushed behind for a corner. The excitement continued past the midpoint of this goalless opening half. Cornerstone had three corners in rapid succession, but was denied success. NCC seemed to be a man short up front, and their direct approach was easily defended. However, when they tried some diagonal passes, across to their right wing, this proved threatening, as did a great kick from James Walter, reflecting his skill in another discipline. Perhaps we could see more of this? Both Ian Jones and Martin Eccles saw headers narrowly miss their target. The visitors had a free kick, which was sent high over the bar, and created several more partial chances as the half drew to a close, a half which was a credit to the determination of the Undertakers. In these finely balanced games a momentarily lapse is often the difference at the end, and so this proved to be the case here. The visitors started the second half, and had scored within twenty-one seconds, as they attacked up their left wing, before cutting into the penalty area and firing the ball past Tim, and high into the net. Taking the resulting centre the Hoops had time to attack, before Cornerstone was again advancing up their left wing. With the home defence out of sight the attacker easily dribbled past the advancing keeper, to send the ball speeding over the ground, and into an empty net, to double the score, with less than ninety seconds of the half played. Cornerstone had several forays up the slope, and their speedy attack meant the home defenders, often missing, had to turn and chase after their quarry. In spite of this NCC did not concede any more goals, either through good keeping from Tim Rudge, good defensive work from a crowded goal area packed with most of the team, or the visitors wasting their opportunities. The hosts denied their opposition as they defended two well-taken corners. When NCC made their attacks they too were met by a packed defence, albeit slightly less dense than that seen at the opposite end. Full credit must be given to the Hoops, who continued to press forward. Then, with three minutes to go, Ian Jones led an attack down the left wing, where he was met by the advancing keeper. He crossed the ball, past the static defenders, where it was met by Chris Rudge, who tapped it home, to create an exciting final few minutes. Almost immediately the NCC were down there again, and nearly saw Tom Hardcastle perform, but the ball was sent over the cross bar. Cornerstone had a final fling, causing the home keeper to pull off another fine save, and so a pulsating match ended, with the NCC narrowly defeated by the only undefeated team in the league. On a bitterly cold day, but one which was brightened by the sun, the home side kicked of this game. At once the NCC was on the attack, only to see their effort go behind, for a goal kick. Shortly after they gained a corner, which was cleared. Then the hosts made a series of attacks, up both wings, including a shot which was well saved by Tim Rudge, the first of a brilliant series he made throughout this finely balanced game. After ten minutes Trinity came up their right side, to send over a high cross. This hit the woodwork and rebounded back into play, where the NCC defence, despite several attempts to clear, failed to prevent an alert attacker from forcing the ball past the keeper, and so open the scoring. During the following twenty minutes NCC made a series of penetrating attacks, which saw them come close to the final line. Following a corner Mark Broekman saw his header pass over the crossbar. Chris Rudge and Tom Hardcastle, who retired injured soon after, had strong efforts cleared by the skills of the home keeper. Ian Jones had almost reached the goal line in one of his exciting efforts, but lost the ball as he tried to walk it into the net! Cheltenham Trinity forced another excellent save from Tim Rudge, taken as he jumped to clasp the ball from above the head of an attacker. Then Trinity had a free kick, which was sent high over the bar, to land beyond the boundary fence. With fifteen minutes of the first half remaining Ian Jones, making another of his piercing runs, was brought down inside the penalty area. Facing the keeper, who was standing slightly off-centre, Ian calmly took the spot kick himself, and sent a curving ball away from the diving keeper, to score. Both sides had further penetrating attacks in the remainder of this half. The home side had two corners in succession, followed by a free kick, which again hit the woodwork. At the other end Mark Broekman mounted a good solo run, only to see his effort cleared by the defence. In the opening minutes of the second half both keepers pulled off great saves, that by the Trinity player was made as he was down on one knee, and stretching above his right shoulder. Such was the pace of the game that each side was able to mount another attack before Trinity struck, with only six minutes of the half gone. A good run saw the home side get behind the NCC defence, and poke the ball past the desperate dive of the keeper. Almost immediately a similar move saw Tim Rudge make another fine save, holding the ball whilst down on his knees. Much of the next ten minutes had the visitors defending, and give them due credit, their line, if shaken from time to time, held. 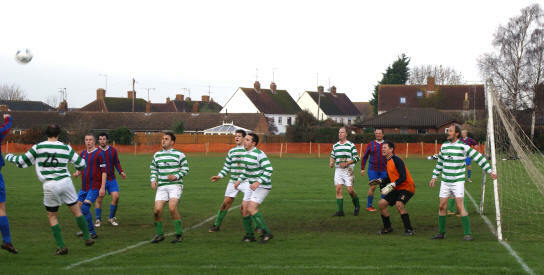 The Hoops made some attacks up the slope, but were unable to penetrate the tight Trinity defence. Their most promising move came from Mark Broekman, who made yet another intelligent individual run, only to see his endeavour roll diagonally across the goal mouth, well past the frantic stretch of the horizontal keeper, before hitting a post. The final minutes saw action at both ends. Although Tim Rudge was the busier credit must be given to both keepers who throughout the match kept their respective side in the game. It could be argued that a draw would have been no more than NCC deserved, especially for their battling performance. An absolutely frozen Michael Wyatt reporting from Newlands, in the grip of Siberian winds. After eight weeks without a match, due to Christmas and the recent severe weather, NCC kicked off this important plate game on a very tacky pitch. 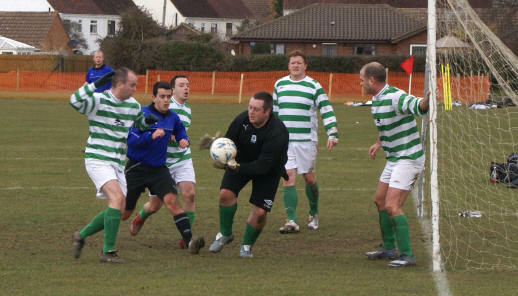 In the opening minutes the green and whites had a promising attack, which was put out for a corner. Then Trinity & Quedgeley moved up a gear, and had two attacks, one gaining a corner and the other resulted in an attempt which went narrowly wide of the goal. On seven minutes, following another T&Q corner, the ball entered the net. Imagine the surprise all round as the score was disallowed because the ball, in its flight from the corner, had curved out of play. After ten minutes a home player made a fine run down the left wing, before crossing the ball, where another attacker turned the defence and sent the ball past the desperate dive of Tim Rudge, to open the scoring. Within two minutes T&Q had doubled their score. However, after a further forty seconds NCC had pulled a goal back. A good through ball found Ian Jones, unmarked, and he was able to lift the ball into the back of the net; all seemed set up for a competitive and exciting game. In the next fifteen minutes both Andrew Murton and Ian Jones had chances to score, but great saves from the opposing keeper denied them. 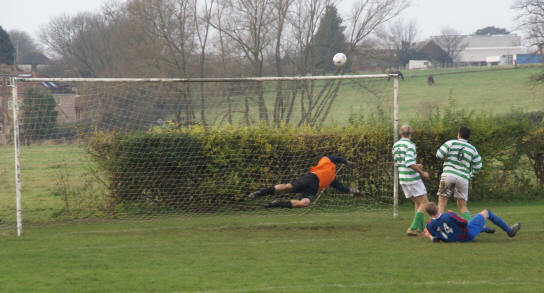 In turn the NCC defence kept out Quedgeley, and Tim Rudge made some brave saves. During the final ten minutes of the first half Ian Jones nearly scored, but another great take saved the day; and then the home side piled on the pressure. In the third minute of time added on a long range opportunist shot from a T&Q player saw the ball speed underneath the NCC keeper, to end up in the net. As the halftime whistle went the Hoops were 3-1 down. From the start of the second half NCC played the better football. They created several chances, but were unable to put away that final ball; denied by a solid defence, and when that failed their shots went wide of the uprights or were saved by the skill of an adroit and alert keeper. Tom Hardcastle had a clear chance but fired the ball wide of the target. In this opening half an hour T&Q themselves had a clear-cut scoring opportunity but Tim Rudge made a great save to deny them. In the closing twenty minutes the home team came right back into the game, and started to create problems, many from nippy runs down the wings. With five minutes left such an attack, down the right wing, was followed up by a good cross, where a vigilant attacker was able to stab the ball home, for the only goal of this half. Not giving up the visitors continued to play hard, and in the last few minutes created some excellent attempts to pull another goal back; but it was one of those days, as the ball continued to be sent wide of, or over, the cross bar. Despite fielding a strong side T&Q had adapted better to the conditions, and the long lay-off. On a cold morning NCC kicked off this match, but was soon defending, as an attack from the visitors gained a corner, which was cleared. Then the NCC was up at the other end, and almost scored, as Ian Jones fired the ball over the bar. Each team had another attack, before the goal-scoring spree began. After eight minutes a forward sped past the home defence, leaving a one on one with the keeper, resulting in a low diagonal shot entering the net. NCC created opportunities; a free kick was shot wide and Ian Jones was unable to better a trio of defenders, as he jumped in an attempt to head the ball, but it sailed over the bar. T&Q created another chance but the ball was shot across an empty goalmouth, as Tim Rudge lay prone. On the quarter of an hour Quedgeley again came down the right wing, where NCC failed to clear the ball, which was fired into the net. Increasing their pressure saw the Hoops create two chances; one was shot wide and the other was well saved by the keeper. Then, on eighteen minutes, Emlyn John took the ball down the left wing. As it crossed their goal the visitors got their defence in a muddle, and could only guide the ball into the net. Within the next four minutes T&Q managed to score twice; the first was rather fortuitous, as an attacker stuck out a boot in an attempt to control the ball, but got a glancing blow, causing the ball to divert away from the keeper, and so into the net. Quedgeley, increasing their momentum, gained a corner before mounting another foray, and easily outpaced the home defence, to score their fourth goal, half way through the first period. Play ebbed and flowed briefly, with Tim Rudge making a fine save from a high ball, but being fouled in the process. Then followed an exciting period of play, in which four goals were scored within seven minutes. This began with a lone Quedgeley forward easily outrunning the home defence, before sending another low diagonal shot into the far corner. Within a minute Adam Cox led an NCC attack down their left wing. The visiting keeper committed himself too early, and came to the edge of his area. As the ball was crossed he was stranded, and could only watch as yet another mix up with his defenders led to a second own goal. Two minutes later the Undertakers came down the other wing, where Lee Bradley rifled the ball into the far corner, easily beating the desperate dive of a wrongly-positioned keeper. Quedgeley had time for two further attacks, one a spectacular long shot, which rebounded safely off the crossbar, before Andrew Murton reduced the deficit to a single goal. The remainder of this goal feast of a first half continued to cause heart palpitations, as NCC became dominant, with several opportunities; Ian Jones had a good chance go wide, the visitors managed to clear the ball from a packed goal mouth and just before the interval the ball so-narrowly passed over the Quedgeley bar. At the start of the second half the visitors made early inroads; they had a shot, which was parried by the keeper, and another, which he saved, with a third passing over the bar. Then the Undertakers were awarded a free kick; which Emlyn John sent over the keeper, and into the net. Unfortunately this had to be retaken, and calamity struck, as the ball hit a post. The visitors were pressing, and had a couple of chances. Then, ten minutes into the half, another attack from the visitors saw them score, following a throw-on, when the ball was lobbed over the keeper. In the next quarter of an hour, as both sides moved the ball up and down the field, Ian Jones had two near misses, and the Quedgeley keeper made a great save as he pushed the ball over the bar. At the other end the ball was crossed, eluding several players, including a T&Q player on the edge of the box. However, the ball was returned, and an NCC player, in an attempt to head the ball clear only managed to guide it into the net, for yet another own goal. This was the start of a repeat of the first half action, in which four goals were scored within seven minutes; déjà vu. Three minutes later a good ball found Andrew Murton, running down the left wing. Seeing the keeper coming out of his goal he cleverly lifted the ball over him, and into the net. Two minutes later Ian Jones received another great ball, and was able to dribble it past the keeper, before slotting it into the net. Within a minute the visitors attacked, and although the initial ball was partially cleared a long shot sped into the home net; for the final goal of the match. In the remaining minutes the excitement continued all over the pitch, with further chances at both ends, and each keeper pulling off saves; NCC even managed to hit the post again in the final moments of this thrilling match. It was a blustery day, with the weather unable to make up its mind; should there be rain or shine? NCC kicked off this match, and faced the full fury of the southwesterly wind. Each side had an early attack; from Cornerstone the shot went wide and for the NCC Tom Hardcastle’s effort was confidently saved by the keeper. After about five minutes the home side had another fast attack down their right wing, followed by a good cross, which was ferociously headed into the far corner of the net. Soon after the home side had another attack and Tim Rudge partially stopped the ball, before gathering it, almost from the boots of a rampant Cornerstone player. The green and whites then attacked, and were awarded a free kick, which was pushed away, and behind, by the keeper, for a corner. Although most of the home team was defending this corner Martin Eccles was able to jump to reach the ball, but his well struck header sailed over the bar. Play moved continuously from one end to the other, causing each keeper to make some compelling saves, and Ian Jones found he was unable to get pass three defenders. Approaching the fifteen minute mark another speedy attack up the right wing, easily outstripping the defence, led to Cornerstone scoring their second goal, as a fierce diagonal shot entered the net. After a beautiful rainbow arched in the sky the visitors brightened, creating several sharp attacks from dedicated individuals, and precipitating quick action in a packed goalmouth. On thirty minutes another attack from Cornerstone lead them to score again; as a well-taken low drive, from the edge of the area, sped through the visitors’ defence. NCC spent much of the next six minutes attacking the hosts’ goal, causing the keeper to make some quick reaction saves. Following another Cornerstone attack the shot was parried, for a corner. It was a case of déjà vu, as the ball was headed in, just like the opening goal. Undaunted, NCC continued in their quest for a goal, and created half chances through the work of Chris Dagnall, Ian Jones and Andrew Murton, with a shot from the latter going over the middle of the bar. Then Chris Rudge came down the right wing, and lobbed over a shot, which sailed serenely into the net, with an expectant Ian Jones all set to finish the job. In the remaining minutes of the half Cornerstone continued to create pressure, aided by the wind, but Tim Rudge denied them, especially following a corner, when a high ball threatened in a crowded goalmouth. With two minutes remaining Nick Jordan, an ex-Cheltenham Town player, fired in a long range shot, to complete his hat trick. The effect of the wind can be judged from the second half, in which the NCC, playing up the slope, but with the wind, conceded the only goal of the period. This half was a series of exciting end to end movements. In the opening twenty minutes NCC created more pressure, and produced several promising moments, but the chances went wide, or were pushed away by the goalkeeper for a corner. Two or three shots sped tantalisingly across the goal mouth. Several players showed great skill, in both controlling the ball and awareness of the position of fellow team mates. Cornerstone had some penetrating attacks, one saw Tim Rudge bring off a great save, as he coolly plucked the ball from above the head of a rampant attacker; another saw a Cornerstone free kick cleared. NCC had a good chance to pull a goal back, but unfortunately the header, from Tom Hardcastle, crashed against the cross bar, and the rebound was fired wide of the goal. Then, in the sixty-seventh minute, a lone home attacker ran down the middle of the field, with the NCC defence nowhere to be seen, and slotted the ball past a prone Tim Rudge, for Cornerstone’s final goal of the day; NCC had been hit for six. Shortly after this the home side wasted a great chance, as two forwards again overran the visiting defence. In the final quarter both sides looked like scoring more goals from a series of corners sent into tightly packed goal areas. NCC finished with several good chances; Adam Cox was unable to control a loose ball which had sped past the prostrate body of the keeper, and Andrew Murton had a shot rebound down from the cross bar, the second time the team had hit the woodwork. Perhaps the final whistle was a relief to all, especially given the conditions, but it heralded the heaviest defeat of the season for the Undertakers. It was a dreary morning, filled with torrential showers and strong winds, as the teams gathered for this cup game. Its start was furthered delayed by a pitch inspection, and finding a referee, but eventually NCC kicked off the match, which turned out to be a five-goal thriller, in spite of the weather. The home side started well and created several attacks, gaining a corner after Tim Rudge had brought off a great save, which saw the ball go behind the goal, passing high over its bar. After the NCC’s opening foray Cheltenham Trinity had a good run up their right wing, and gained another corner. This was followed by two penetrating attacks from the visitors. From the first Chris Rudge had an effort go wide; and then, in the twelfth minute, Ian Jones dribbled the ball in from the right, and lifted it past the advancing keeper, and into the net, to open the scoring. Tim Rudge had brought off a great save. . . Immediately Trinity ran up their right wing and crossed the ball, but good defensive work denied them. The next attack, up the other wing, was dented by an excellent save from Tim, in a one-on-one situation. After bobbing about in the NCC goal area the ball eventually found its way down to the other end, where Ian Jones saw his shot just go past a post. In the next fifteen minutes Trinity created several chances to score, but good defending and goalkeeping kept the ball out. Attacking again, Trinity had a corner but the ball went out for a goal kick. Then Trinity moved up a gear, and had half a dozen attacks, up both wings, but all were stopped, mainly through brilliant goalkeeping. After a lone attack from Ian Jones, which saw the home keeper catch his shot, Trinity again spent time at the opposite end, attacking along both wings, and winning a corner. Then, approaching the half hour mark, another attack led Trinity to score an equalising goal, when poor defending allowed a Trinity player to fire the ball into the bottom corner, as the keeper, static, watched it pass him. For the remainder of this half the NCC had numbers in defence, but often a dearth when attacking. A rare glimpse of the sun encouraged the players, and this was visible in the skills demonstrated. We saw Ian Jones try to pass three defenders, and Andrew Murton make a good run down the rarely used left wing, before Trinity had a series of attacks. Although Trinity posed greater threats play was not all one sided, and the Undertakers continued to threaten; a Lee Bradley header looping over both players and bar. Following a final Trinity attack the half-time whistle was a welcome breather. As the second half began we were treated to further sunshine, with a backdrop of an awesome black sky. Play flowed briskly both ways, with chances created at each end. Chris Rudge had a strong run up the wing, but his cross was blocked by one of several defenders, but so very nearly crept in. Following a corner Chris had another near miss, but a well-judged outstretched leg guarded the ball from a final strike. Several Trinity attacks saw the ball fly over the bar, a long range diagonal shot cross the goal area menacingly and a threat from the right successfully dealt with. Following a brief attack from NCC it was the turn of Trinity again. In the sixty-sixth minute a low shot was misjudged by Tim Rudge, and the ball continued into the corner of the net, for Trinity to take the lead for the first time. Five minutes later the home side again had the ball into the net, as Tim had come out to meet it, but the score was ruled out for offside. The following quarter of an hour saw plenty of activity and excitement, especially from Chris Rudge, whose new boots were obviously working his magic. He saw the home keeper make a catch, standing on tip toes, and he repeated this a few minutes later, when the hosts nearly conceded an own goal. Then, following a corner, his powerful header was deflected off the back of a defender. One NCC attack saw Chris cross the ball towards Ian Jones, but the keeper and defender got there first, again almost losing the ball between them. At the other end good saves from Tim Rudge kept the ball out, in one he pushed it adroitly over the bar. With two minutes of normal time remaining Ian Jones dribbled the ball up the left wing, and, running through the Trinity defence, rounded the keeper before placing the ball in the back of the net; 2-2. Following this goal Trinity made the next attack, and so fast does the game revolve that they made yet another attack, which led to them regaining the lead, just forty-nine seconds after losing it! Trinity must have thought that the horse-drawn Father Christmas landau passing was coming to them! Despite NCC pressure, in which they won a free kick and successive corners, Trinity held on to progress into the semi-finals of the cup. On a brilliant sunny day, enhanced by clear blue skies, NCC was at home to the league leaders, and obviously hoping for an upset. There was a sensational beginning; from the onset the visitors attacked down their left wing, where a good cross was met by an alert player who headed the ball into the NCC goal; just fourteen seconds on the clock. This was not the start the NCC team needed; from then onwards they were always playing catch-up. NCC had a quick chance at the other end, but the ball ran across the goalmouth, eluding the players. Trinity created several more chances but both Tim Rudge, who made a good save from a diagonal shot, and the home defence, kept the visitors out. Trinity nearly scored again, following good use of the right wing, but sharp tackling, from captain Alex Wilkins, subdued the attacker, whose weakened snapped shot was easily saved. Soon after NCC saw a couple of chances go high and wide, then the hosts had a well taken corner, which was partially cleared, before the Trinity defence managed to dispatch the ball away from their tightly packed goalmouth. Trinity mounted a couple of attacks up their left wing, which resulted in a high lob harmlessly passing the goal, and a low diagonal shot go straight into the arms of the keeper. Ian Jones had a couple of threatening efforts, one being a shot which passed just over the bar. Play continued to pulsate from one end to the other, and Trinity mounted a succession of attacks, which saw an acrobatic overhead kick eventually saved by the diving keeper, and a well taken corner. Then the Hoops were up again, where the Trinity keeper, reading the situation well, was able to hold the ball. After this quick raid into the visitors’ half the home team had a free kick to defend. However, this shot was wasted, as it was sent high over the players, and straight into the arms of Tim Rudge, who calmly awaited its arrival, without having to move his feet. The balanced play continued, with each side making a series of raids into the other team’s territory. Shortly after Trinity had hit a post it was the turn of NCC to be dominant. They too had a series of ominous attacks, which saw the ball cross the opposition goalmouth, and a well taken Lee Bradley corner headed high over the bar, following a giant leap from Alex Wilkins. The next few minutes saw NCC inside the opposition half, where both Andy Murton and Ian Jones had valiant efforts at goal. After a rapid Trinity run down the wing, with a cross and well cleared corner, the NCC was attacking again. During this run of alternating attacks Tim Rudge brought off a brilliant diving save from the feet of an advancing forward, but then things went wrong. Approaching the half hour Trinity outran the home defence, and conceded a throw-on. Poorly taken, this led to Trinity scoring their second goal, when the ball was sent across to the left wing, where a well-flighted pass saw another forward send a low shot through the spread of defenders, and so past the desperate dive of the home keeper, to rest in the far corner of the net. The excitement continued, with Tim pulling off more great saves, but two minutes before half time he was beaten, and Cheltenham Trinity again had the ball in the net, but the linesman’s flag had long been up for offside! Then the home team made a strong attack, Ian Jones saw his effort cleared, another was saved by the keeper, and soon after the NCC won a free kick. Fired towards the near post the ball was parried by the keeper, where Dave Matthews made a sustained and valiant attempt to poke the ball home, but was denied by brave keeping from the prostrate keeper, who eventually gained a free kick. Following one last effort from the visitors the half ended, only two goals had been scored but it was a pulsating spectacle of exhilarating football, but better was to come. At the start of the second half much of the early play was centred around the middle of the pitch; it was some three minutes before any opening attack was made, when Trinity made a run down the left wing and Tim Rudge ran out to make a save. 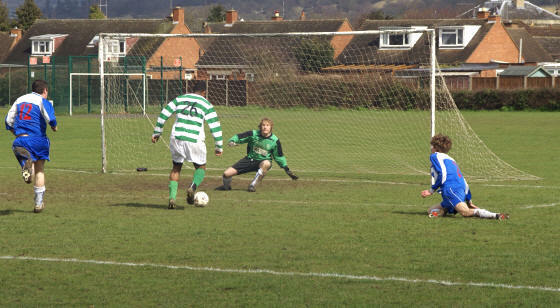 Then North Cheltenham went on the attack, forcing a partial save by the keeper, which went behind for a corner. This the keeper saved from the head of Ian Jones as both jumped for the ball. The end to end play continued at a relentless pace, with each keeper making good saves. NCC were unfortunate when, in the sixty-third minute, an attack up the left wing saw Andy Murton cross the ball towards Ian Jones, but brave action from the keeper saw him dive and partially smother the ball, but exasperatingly no one was around to tap home the loose ball. However, NCC came back in the following minute, and again sped up this left wing. 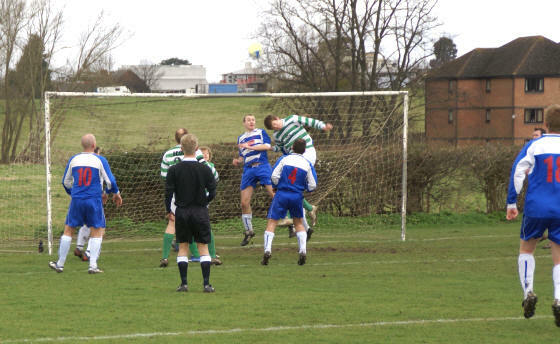 Here Ian Jones successfully sent in a gorgeous header, which ended up in the top corner of the net. The keeper, standing almost on his line, could only watch its triumphant trajectory, as the hosts opened their account. This was the start of a frenetic seven minutes, in which three goals were scored, two by the NCC. From the kick off Cheltenham Trinity attacked, and had the ball in the net, only to see the result cancelled out. NCC did not learn from this loss of concentration, for, undaunted, Trinity tried again, running up their right wing to send an aerial lob across the goalmouth, where it was returned across the goal, only this time it was sent into the far corner of the net, 1-3. Having survived the next NCC attack Trinity then spent the following five minutes bombarding the green and whites’ goal, gaining three corners and forcing Tim Rudge to make at least two saves. The hosts survived this pressure, and then attacked again. Here Ian Jones passed a well balanced kick to Andrew Murton, waiting in the goal area. It only needed an accurate thrust from him to slide the ball past three defenders, and the keeper, to make the current score 2-3. The away side had a chance to score but the shot hit the side netting. Then Chris Rudge made an exciting run up the left wing, but his pass to Mark Broekman, waiting in front of an empty goal, was intercepted by a well placed defender. Immediately following this a good ball was sent through the middle of the field, where Andrew Murton and Ian Jones were both waiting. Unfortunately Andrew, with acres of space, and only the keeper to beat, was thwarted by the brave efforts of this last defender. Following a Trinity attack Ian Jones, running across to the right wing, received the ball, and dribbled past a defender, before he was upended in his effort to pass the final defender, but appeals for a penalty were denied. Trinity won two corners, and mounted successful pressure on the NCC, with more well run forages. From another diagonal kick the ball entered the net, with the home defenders completely out of place; 2-4. Undaunted, NCC applied pressure of their own, and had a great chance as the ball sped across the goalmouth, only for Mark Broekman to head just wide of the goal. Trinity then missed perhaps the easiest of their chances, as the ball was sent past the diving Tim Rudge, and continued across the empty goalmouth, to finish beyond the line, before an advancing forward could reach it. From this let-off NCC delivered the ball up field, to Ian Jones. With great composure he was able to control the ball past three defenders, and then from the approaching keeper, before slotting it home, with most of these players ending up in a heap; 3-4. NCC was still a goal behind, but there was only five minutes of play left. The spectacle continued, of both sides creating and defending great chances, with Trinity again missing out with their dangerous charge, followed by a diagonal kick. In the final minute it was this method which clinched the game for the visitors, as they easily outpaced the NCC defence, who were nowhere to be seen as Trinity rounded Tim Rudge, to score number five. There was just time enough for NCC to make one final effort, but the Cheltenham Trinity keeper was up to this, and as the final whistle was blown the visitors must have felt a great sense of relief, as they finally won a pulsating game played with great determination and excitement by both sides. We do it all again in a week’s time when the side meet in a cup match! 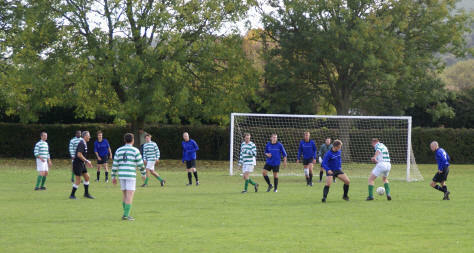 On a bright but cloudy autumnal day Diamonds kicked off this match. In the opening minutes both sides alternated attack with defence, and play switched up and down the field. The home side had the better of these initial forays, which saw Martin Eccles fire a neat pass from Paul Broekman over the cross bar. Then Diamonds were awarded a free kick, from the edge of the goal area. After the distance was carefully paced out the resulting kick was sent just wide of Tim Rudge’s right hand post. The home side continued to probe, and Tom Hardcastle had a good chance but saw his shot fly over the cross bar; another shot casually crossed an unguarded goalmouth. Almost immediately after this the home side went down their right wing, where Mark Broekman gained a corner. The ball was floated across a crowded goalmouth, and thence headed into the net. Following vehement protestations from the visitors the goal was disallowed, for handball. After this disappointing moment the home side created two more opportunities, but both went wide. Soon after Chris Rudge had a great chance, and lobbed the keeper, who had come well out of the goal, but his attempt just went over the bar. The goal had to come, and on twenty-eight minutes Ian Jones, who saw the keeper coming off his line, calmly lifted the ball into the net, to give the home side a deserved lead. Soon after he made a great solo run before his effort was nullified. In turn Diamonds had a series of penetrating attacks, from one the ball sped over the ground and past the left hand post, ahead of the diving keeper. Five minutes before half time NCC, awarded a free kick, saw the ball go out for a corner. Then Lee Bradley sent in a low delicate pass, where James Walter was able to flick the ball into the goal, past an unsighted keeper. In the remaining minutes up to half time the opposition came into the game more, and caused Tim Rudge to pull off a great diving save, a prophetic glimpse of what was to come. Diamonds attacked from the start of the second half, and gained a corner, which narrowly missed the post, as the ball was sent out of play for yet another corner. Following an NCC attack Diamonds came up their right wing, and sent over a fierce cross. This hit Martin Cookson, and the ball ballooned high into the air, completely wrong-footing Tim Rudge. Although he made a desperate and despairing dive the ball ended up in the corner of the net; the half had only been going for five minutes. The visitors continued to look much the sharper, and continued to pile on the pressure. Four minutes later they were again inside the home side’s goal area, and, despite most of the NCC defending their castle, the visitors managed to thread the ball through the crowded scene, and so into the net. What a start to the half, not that which the hosts were expecting. Diamonds continued to look dazzling, and forced the home keeper to run out and collect the ball. Gradually the NCC regained their composure, and again made further attacks of their own. This was a period when individuals shone, but at the fast pace of the game they were overlooked; Paul Broekman made a superb block, and Lee Bradley had another excellent corner cleared by a defender jumping up acrobatically to head the ball away. The visitors had two quick corners, one from each side of the field, but they sent the ball high over the cross-bar. Following a stoppage, for a clash of heads, play went through a quiet period, but then suddenly heated up for the final minutes. Although Diamonds had one serious attack, blocked by Chris Rudge, it was NCC who mounted a series of sharp forays, which were denied by admirable work from the visiting keeper, who made at least three excellent saves, perhaps the best from the feet of Mark Broekman, who so nearly snatched a late winner. However, from their spirited second half display, Diamonds deserved their draw, a fair result for all. On a chilly autumnal day NCC kicked off this league match, at The Burrows, a ground enhanced by the many beautiful colours exhibited by its boundary trees. In the opening minutes the home side had several penetrating attacks, one gaining them a corner. From this corner the ball rebounded, fortunately safely, off the top of the crossbar. Another attack saw James Walter, in goal for this game, make a good save, and yet another saw a Cambray shot rebound into play, after hitting the right-hand post, but the follow-up kick was sent high over the cross bar, with the NCC defence nowhere. Not to be left out the NCC made a few attacks, but were thwarted by a resolute Cambray defence. After ten minutes the home side again ran up their right wing, where two forwards were able to outpace the defence. James made a desperate attempt to regain his goal, which was unattended, but could not prevent a slick forward from sending the ball past his diving body, and so into the net; and for the first time this season the opposition had opened the scoring. Almost immediately Cambray had another shot, which was well saved by the diving James, again the defence was missing. Having survived, the NCC battled their way into contention, and mounted a series of penetrating attacks, which kept the Cambray keeper on his toes; he made several fine saves. After twenty-three minutes a good long ball found Ian Jones, who adroitly dribbled around a lone Cambray defender, side-stepped the keeper and calmly slid the ball into the net, to level the score. For the remainder of the half both teams battled up and down the field, each side creating several chances. Cambray had a slight edge, but the NCC defence became better organised, and denied them. James made another tumbling save, and gathered the ball in spectacular style; from another attack a long shot was pushed over the bar, and out for a corner, with the visitors’ goal mouth packed with players. The Undertakers also made several forays, winning a corner, as well as forcing the Cambray keeper to make more fine saves. Other shots went wide, including a free kick. The half time score was a fair reflection of play, but it demonstrated how much work would be needed if the NCC were to salvage something from the game. The opening ten minutes of the second half saw a lot of action, mostly from a determined Cambray outfit. NCC was very fortunate when the initial attack saw the outstretched leg of a Cambray forward unable to direct the ball into the net; instead the resulting kick missed the upright by a whisker. Following a brief attack from the visitors Cambray mounted another furious charge down the field, but this was well defended. Almost immediately Cambray came back, and had a free run at goal, with the NCC defence missing; the team had a fortunate let off. This pattern was repeated in the fifty-third minute, but this time the Cambray attacker was able to win the one-on-one situation, to restore the Cambray lead. For the next ten minutes play was about equal, perhaps the main difference was the ability of Cambray to defend in numbers, often eight players securing their goal area. 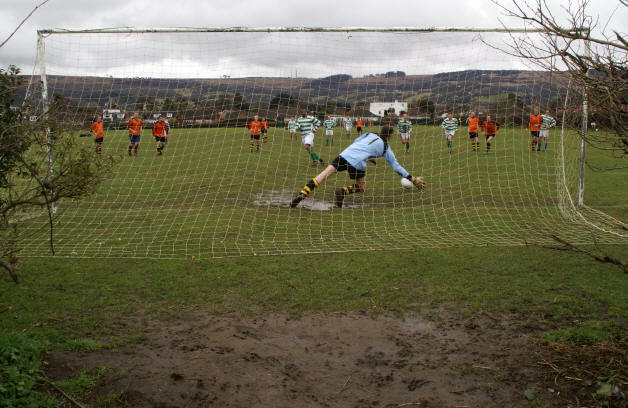 This happened on at least two occasions when the Hoops were well placed, one ending with the goalkeeper, and two players, lying on the floor in a goal-mouth scramble, but the home side cleared their line. With half an hour to go an attack from Cambray led to their third goal. They ran down the left wing, into an area devoid of NCC players; who were chasing back as fast as they could; and sent in a low diagonal shot, which ended up in the far corner of the empty net. Cambray continued to dominate play, and continued to waste great scoring opportunities, invariably shooting wide of goal, or seeing James Walter pull off yet another fine save. The NCC had a brief spell of attacking, but was again denied by sheer weight of numbers, or a near miss at the right hand post, as a Lee Bradley header went wide. Cambray almost scored again when a penetrating run outran the defence, only for James to make a brilliant stop, and parry the ball behind for a corner, which, although well taken, was shot wide. With five minutes to go a repeat attack led Cambray to score their fourth goal, as another diagonal shot sped into the far corner of the NCC net. But the NCC did not give up, and ended the game in fine attacking style. Andrew Murton had a shot saved by the keeper, then Lee Bradley, named man of the match, Martin Eccles and Andrew Murton all had shots which went wide, or were hit over the cross bar. As the final whistle went I felt the team did not deserve to lose by three clear goals, their first defeat of the season. A crestfallen Michael Wyatt reporting from a bright but overcast Burrows. On a bright morning NCC was host to St Matthews, who wore their new kit, dark blue with white and blue stripes running across their chest. In the opening minutes NCC made the running, and caused the St Matthews defence to work hard, although the visitors gained a corner, which was cleared by an able NCC defence. 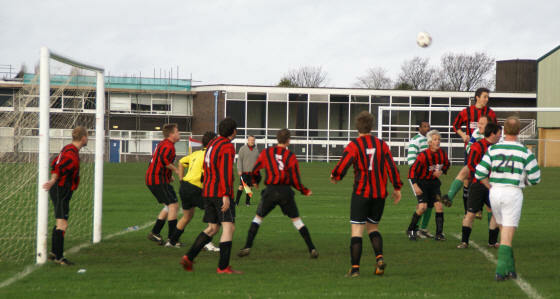 Then in the sixth minute NCC attacked up their right wing, where Ian Jones, having eluded a defender, sent over a cross. This was met by Chris Rudge, who fired the ball diagonally into the net, to open the scoring. Within two minutes another attack from the green and whites saw the roles reversed; Chris Rudge sent in a cross, which Ian Jones sent past the diving keeper, to score in the right hand side of the net. What a start, NCC two goals ahead so soon, would they achieve their first-ever victory over the visitors? NCC made two more good runs, which saw the keeper make a fine save, before St Matthews began to pull themselves together. They had two quick forages, but brave goalkeeping, from Tim Rudge, prevented a score, but saw him take a blow. Then the away side was awarded a free kick, just beyond the goal area. This was sent high into a packed area, eluding all of the defenders but not a forward, who cleverly headed the ball into the corner. In a valiant attempt to save the goal Tim crashed into the upright, and needed another breather. Although both sides had several attacks, denied by good defending, the Undertakers proved the more dangerous, and made more penetrating attacks. However, on 26 minutes, the visitors were able to equalise when they beat the defence, and lifted the ball over Tim, running out in an attempt to smother the ball. For the remainder of the half the home side attacked more frequently, and were denied by some good anticipation from the Saints keeper. However, the visitors were not to be denied their share of play, and their less frequent attacks proved more of a threat. For the spectator it was turning into a good game, but one which was frequently held up as players began to take knocks. Perhaps the half time whistle was a relief to all, and would allow both teams to regroup, for what promised to be a tense second half. The second half was played at a cracking pace, with each side making an attack, and then defending an opposition attack. 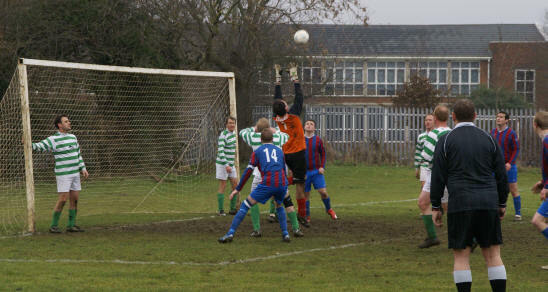 An early NCC attack saw the Saints keeper make a superb save, before a speedy Chris Rudge was able to reach the ball. Shortly after the keeper made yet another great save, this time knocking the ball away from above the head of an attacking NCC player. Approaching the half way period of this second half a thumping shot from Alex Wilkins was pushed over the bar by the agile and alert keeper; he was the difference between the two sides. Both Lee Bradley and Ian Jones had opportunities to score, but were denied by the keeper. Towards the end of the game St Matthews began to gain the upper hand, and made a series of attacks, which saw Tim Rudge make two good saves, and the Saints created at least three other great chances. In spite of this the Undertakers continued to attack, and in the last moments Andy Macauly saw a half chance denied by a high jumping defender. As the final whistle went the NCC had maintained their unbeaten run; on another day they might have taken some of the many chances they had created. This fixture has the bonus of deciding who keeps the Grant Bayliss Cup, offered to commemorate of the help given by the opposition team in the creation of NCC’s participation in the church league. Following this draw a penalty shoot-out would settle the cup-holders. The visitors scored from their opening shot, as did the NCC; but in the subsequent kicks the Saints had one saved, and one went wide. The home team fared better, and as a result NCC hold the cup, for the first time. Well Done! Most of you remember Fr Grant Bayliss, curate here from 2003 to 2007. 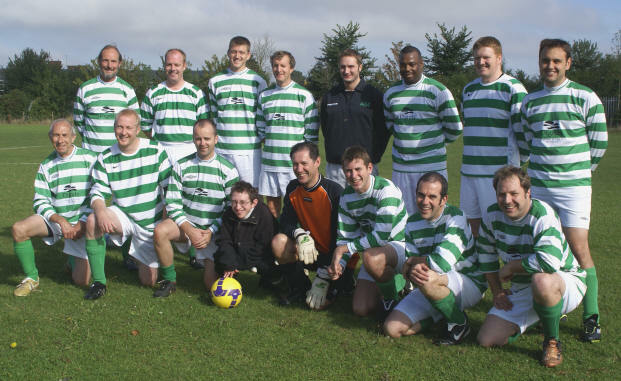 Our North Cheltenham Churches (NCC) football team was set up as a result of encouragement by St Matthew’s and Fr Grant’s enthusiasm for the church to engage in sport. 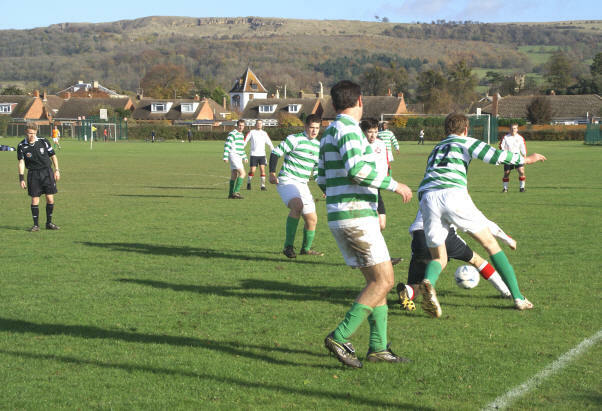 NCC played their first game against St Matt’s in December 2005, and after a season of friendly games entered the Cotswold Churches League in the 2006-7 season, with Fr Grant as one of the key players. After Fr Grant moved away, NCC maintained their links with St Matt’s, even on occasion training together. They felt it would be fitting to have a cup for games between the two teams, and decided to name it after Fr Grant. So whenever NCC play St Matthew’s the winner is awarded the Bayliss Cup. On a cloudy morning, with a very stiff wind blowing diagonally across the pitch, NCC kicked off this fixture. 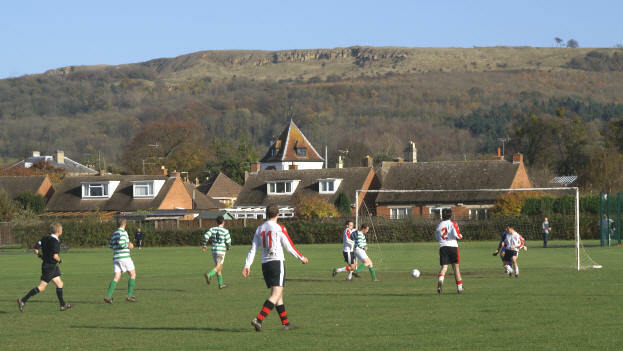 The game was played at Tewkesbury Trinity Tiger’s new ground, at Bredon Hill Middle School, surrounded by uplifting views to the neighbouring hills; NCC was trying for three wins in a row. Although both sides started well, and created chances in the opening twenty-five minutes, the NCC, with the wind behind them, was dominant, and soon had two shots go wide of the goal. After denying the Tigers’ opening attack NCC created a great opportunity through Adam Cox, whose shot, from the edge of the penalty area, was well saved. This was followed by two cleared corners, a shot, which was wide, and a further shot, from Ian Jones, which was well saved by the keeper. In between the Tigers had another attack come to naught. Approaching the twenty-five minute mark NCC made another run, this time up the rarely used right wing. Here Lee Bradley met a well-flighted cross, and sent a powerful header past the desperate lunge of the Tigers’ keeper, for NCC to take a deserved, albeit brief, lead. Within seventy seconds the ball was in the opposite net, following a determined Tiger move, which saw the ball drilled into the bottom corner of the NCC goal, with the keeper rooted to the spot. For a brief spell the Tigers threatened, winning two corners, and seeing a shot pass wide of the goal. The final ten minutes of the half saw the Undertakers again assertive, with a great chance to score when Tom Hardcastle volleyed, but the ball hit a post and was put out for a corner, which was cleared. In the opening fifteen minutes, following the restart, a vastly improved Tiger team dominated the game, making full use of the strong wind. They had an early corner, which was put behind for a goal kick; more corners, and a free kick followed this, with the ball going out for another goal kick. 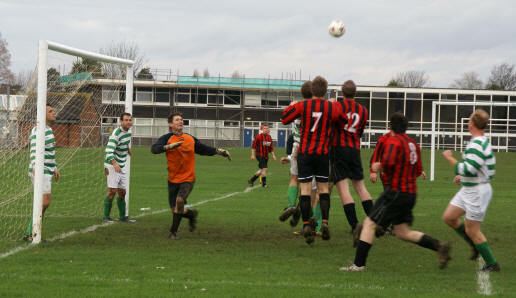 North Cheltenham absorbed this pressure and managed an attack, winning a corner. However the home side continued their bombardment, with corners and three shots passing close to the NCC goal. Then came a brief period when NCC easily held their own, and, despite playing against a stronger wind, and up the slope, managed to mount some penetrating attacks; they won two corners and fired two shots, both going wide. For the final fifteen minutes Tewkesbury had twice as much play as NCC, but failed to break a determined defence, led by man of the match Martin Cookson, and ably backed up, with a series of good saves, from an alert Tim Rudge. When NCC attacked they were met by a packed Tiger defence, spaced out like intermediate forts along a frontier. With some ten minutes remaining Tewkesbury had a well-worked charge, and a fierce strike saw the ball ending up in the NCC net, but, luckily for the Undertakers, the goal was disallowed for offside. In the final minutes of the game the Tigers won three corners, including two in succession; as the final corner was cleared so the final whistle was blown. Overall a draw was a fair result, any other result would have been a travesty for both sides playing under trying conditions. A tortured Michael Wyatt reporting from Bredon Hill Middle School, Ashton Under Hill. On a warm overcast day Diamonds kicked off this game, in the plate competition. Although they had an early free kick the ball went straight to Tim Rudge, in goal, who collected it safely. 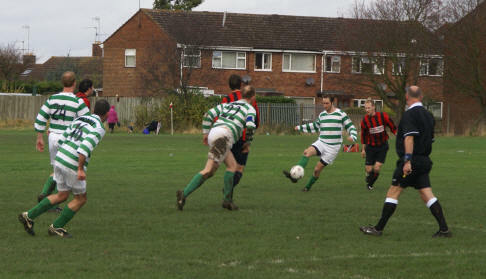 This was followed by an NCC attack, with some good play between Andy Macauly, Adam Cox, Andrew Murton and Chris Rudge, the latter having a shot which was close to the goal. Again the NCC created a penetrating attack, and Tom Hardcastle sent over a good cross. This was met by Martin Eccles, but his header went over the bar. NCC dominated the opening twenty minutes, and now it was the turn of Ian Jones, who made a solo run, easily eluding the Diamond defence. However the keeper made a good stop, and parried the ball behind for a corner, which Diamonds easily cleared. Approaching the twenty-minute mark Andrew Murton sent a great controlled pass up field, which found Ian Jones. With great composure he fired the ball into the back of the net, and NCC deservedly opened the scoring, after a series of missed opportunities. Within two minutes a determined attack from the visitors saw them win a corner. The ensuing cross was partially cleared by the NCC defence, and went out for a throw just a few yards from the edge of the home side’s goal area. 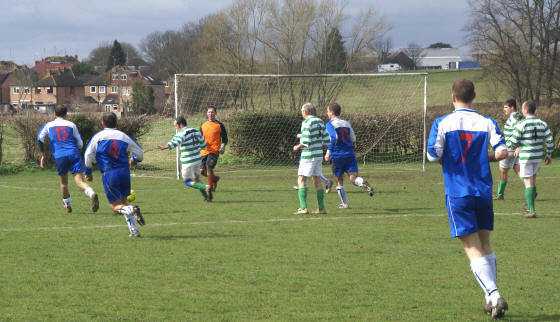 A well-taken throw found an unmarked attacker, who sent in a hard header, for an equalising goal. Within a minute another well-directed pass found Ian Jones, who cleverly rounded both defence and the keeper, who had come out too far, before slotting in his second goal and so restore the NCC lead. Although NCC created a few more chances, which saw the ball going wide of the goal, it was Diamonds who made most of the remainder of this first half. Ten minutes before its end a good attack from them saw a player turn his marker, inside the penalty area, before sending the ball into the net, to level the score yet again. Three minutes later another Diamond attack lead to a clumsy tackle, and the award of a penalty. The taker made no mistake, and sent a low shot into the left hand corner of the net, to put his team into the lead for the first time. Approaching half time Ian Jones made another solo run and his shot passed near the post. An exciting period of play for the uncommitted viewer saw five goals within a twenty-minute period. Compared to the opening period of play the start of the second half saw both sides more evenly matched, although Diamonds made better use of their chances. Having defended another attack, NCC made two quick attacks, with both Ian Jones and Andrew Murton shooting wide of the goal. Then Diamonds attacked, and got a corner, which was cleared, the ball being sent up field. This saw the visitors bring the ball into the NCC area, and score when an attacker beat his marker and fired into the bottom corner of the net, to put his side two goals clear, with half an hour of play remaining. As in the past NCC showed that dogged resolve they have, and continued to strive with great determination. A chance was created but Martin Eccles saw his shot go just wide of the goal. Five minutes later another NCC attack saw them inside the Diamond penalty area. Here Andy Macauly sent a delicate pass to Martin Eccles, waiting in a better position just a few feet away. 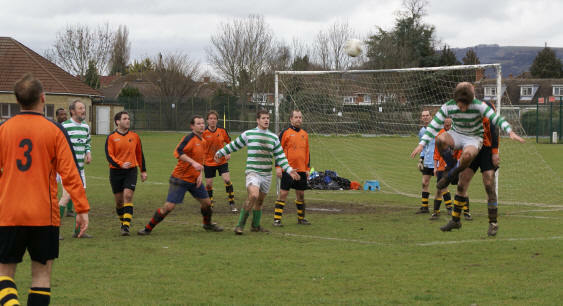 Martin sent in a thundering shot, which crashed into the bottom corner of the net, to score in his first game of the season. NCC became rampant, and had a series of pulsating attacks, which saw them have two corners and a shot from Chris Rudge clear the bar. Then a good through ball found Ian Jones, who scored, and in so doing achieved his hat trick, a first for the team. All square with twenty minutes left, what a thriller this game had become. Immediately Diamonds had a couple of attacks, followed by corners, which the defence was able to deal with. Then an amazing event happened, which gave the game to the NCC. As the NCC attacked they sent a high ball into the Diamonds half. This was met by a solitary defender, who lifted the high ball back to his keeper. A very alert, and fast, Andrew Murton, sizing up the situation, was able to sprint to the ball, and gently guide it into the empty net. Again NCC took the lead, and we had a most tense final quarter of an hour. Even though each side created more chances, this proved to be the final goal of this thrilling game, deservedly won by the home side, who created almost twice as many attacks as their opponents. This was the first time NCC had ever beaten Diamonds. On a beautiful autumnal morning NCC kicked off their opening game of the new season. For the first couple of minutes the home side made the running, having one shot narrowly passing the right hand post, and another saved by Tim Rudge, in goal. However, the NCC were soon into their opposition’s half, and were awarded a free kick; it was noticeable that T&Q seemed to be only marking players, rather than positions. The visitors spent the next few minutes pressing hard, with Mark Broekman showing early skills with a good header, easily out-jumping everyone else. The opening twenty minutes were well balanced, with NCC the better team in midfield but T&Q made better use of the wings, especially their left. Both keepers made good saves, and also saw the ball pass perilously close to their goals. Then, just after twenty four minutes, NCC mounted another attack, down their left wing. 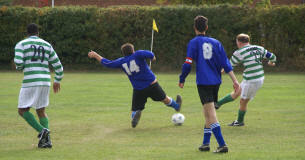 Although T&Q made a good tackle they were unable to clear the ball, which sped across the goal mouth. Here Mark Broekman and Ian Jones were waiting, and the latter was able to shoot, diagonally, and see the ball end up in the far corner of the net, past the keeper, who was left stranded at his near post. 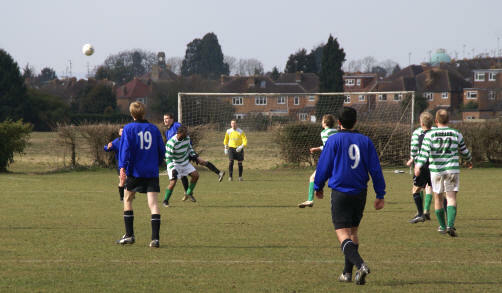 During the following two minutes the green and whites fired two chances over the bar. The NCC had a fine period in which they dominated play, and would have scored again, but for a good save by the T&Q keeper. NCC did not have things all their way, and the home team made some penetrating attacks, one saw the ball skid close to the upright. T&Q pressed hard in the final minutes of the half, but the visitors matched them, defending two corners, and a fine high catch by their keeper saved the day. Then, in time added on, Ian Jones skilfully eluded two defenders, and dribbled the ball beyond the goal post, before sending a low shot home, past the desperate dive of the keeper. Shortly after this the half came to a close, with the visitors, fitter and showing the greater determination, deservedly in the lead. The hosts kicked off the second half, and immediately attacked, although unsuccessfully. This was followed by NCC making a good run up their right wing, where Mark Broekman crossed the ball. It bobbled about before Ian Jones sent it wide of the goal. Almost immediately this duo sped up the left wing, where Ian Jones dribbled past the keeper, who had come out too far, before he sent over a delicate high cross. This was met by Mark, who, with great coolness, headed into an empty net, as a despairing defender arrived too late to be of any assistance. This was his opening goal for the club. The half had been going for just eighty-five seconds, and T&Q were dejected, and looked down and out. Within a minute Mark saw the keeper beat him to a great through pass. Several players fell on the hard pitch, as play ebbed and flowed over the field. The home side saw a determined three-pronged attack fail, as Tim made a great save, with his defence too far away to be of any help. The home side increased their pressure, and had a good period of play, during which they made a series of attacks, which were dealt with by a resolute defence, or else were shot wide. In between the visitors had some near misses of their own, including a shot, from Mark, which hit the bar, before the keeper was able to send the rebound behind for a corner. Soon after this Mark Broekman made a great run up the left, where he created a great chance to score. Seeing the keeper well off his line he fired a fast volley, but unfortunately the ball hit the base of the far post, and rebounded for the keeper to gather. With twelve minutes of play left the home side made another attack, and hit a wonderful high long range shot, which flew into the net, with the NCC defence well beaten. The last few minutes were nail biting as each side continued hard to create chances. Then the final whistle went, giving the result to NCC, which was no more than they deserved. They had played the better football, and appeared to be both fitter and faster, a great start to the season. Deservedly Mark Broekman was named man of the match.